"Ill?" Zaxorie repeated before the slime girl pointed at her horns and asked what she was. "Oh uh..." She said still confused by their encounter. "I'm a teifling." She said cautiously trying to read the woman's face with no luck. "Well half, full teiflings are a crimson red." Zax continued as she heard another person walk but didn't look over to see who. "What are you, I mean if you don't mind me asking?" She cursed herself for drinking. While she wasnt hammered or overly tipsy her calculated charm was certainly suffering. Not the Crystal didn’t like the scale, the opposite rather. There is always somone new here to talk. It has sought of turned into the mult-cultural tavern in her opinion and she liked that about it. She needed a place to stay for the night and she is happy with her choice. Other places in Azuira aren’t as friendly to her kind which she still doesn’t know why. Before she could dwell on the subject she fixed the mask on her head and headed through the door staff in hand. Her nine tails silently and lightly drifted behind her as if they floated on air, seemingly going in random directions. When she opened the door a warm gush of air hit her that made her eyes smart a bit. Her eyes fixed forward as she walked through. A few stood and sat around. Two towards the corner who seemedto be very interesting individual’s but what really caught her attention is the opal elf. They rarely travelled outside their borders. Crystal had visited twice before and both times she injoyed her stay. She loved their peaceful culture. Ultimelty it gets her wondereing what one is doing here. Having quiet a bit of time on her hands she casually walked to the elf, brushing some dirt off one of her tails as she did. Zyme's eyes seemed to scrutinize every visible inch of Zax as she spoke, though she still seemed most intrigued by the curling horns. "Half teifling?" Zyme repeated in question. " Your color is pleasant", she added in what seemed a compliment. In response to Zax's following question, Zyme drew back the hood of her cloak. The tavern lighting flickered through her translucent face, faintly sparkling like a gemstone. " I am Zyme, many made one, the creation and creator." she answered. It was a rather cryptic response to say the least. " You are half teifling, what is the other half?" It was painfully obvious that she was a very inquisitive being, almost childlike in curiosity that was not easy to satisfy. PRINCESS MYSTERICA The elf watched the two as someone new came up and spoke to her. She turned a little, looking at the Kitsune. She is pretty sure she had seen the girl before, or at least, one of her kind. She always made it her priority to know about any visitors that came to the country, since not many ever really came. She was a very curious individual afterall. Everything fascinated her. "Mysterica," she replied with a smile. She spoke the language rather well, but her accent gave her away. "It is nice to meet you. You are a kitsune, correct? That is one of the few races I know and have seen." Zaxorie was surprised by the compliment but smiled politely. "Thank you, yours is rather dazzling." She replied and listened to Zyme. She was hoping that would be the end of her questioning but she kept going. "Zyme why don't you sit down and have a drink? Oh also I'm Zaxorie The Relentless, I play at the Torren you've probabbly heard of me." She said changing the subject and offering the stool next to her. Crystal gave a small polite chuckle, half expecting her response. 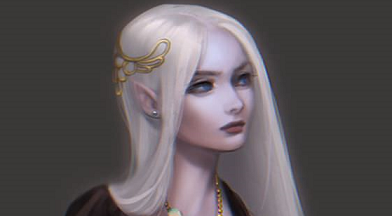 Once again she was reminded on how isolated opal elves are from the world. That only added to her curiosity as to know why one is here. Perhaps a mission of some sought or vacation. Seeming as they would be talking to a length Crystal took a seat next to Mysterica. She leaned her staff against the bar and loosened her katana around her waist, making it more comfortable to sit. He tails drooped across the floor around her. She thought about her name as it strung a chord in her memory. That name she has definitely heard before. A name of importance plus her accent. Rich of her kind and well spoken. In response she said, “Yes I am. I have visited your borders twice before although it has been around fifty years ago since my last visit and I know for a fact a few others of my kind have visited as well. It’s truly a remarkable country...” Trailing her last sentence as she remembered her last visit there. Crystal’s ears turned and twitched as the other two behind her continued their conversation. "Zaxorie" Zyme replied with a nod, accepting the offer to sit as she moved from her looming stance to settle upon the stool. Her movement was quite as unconventional as her appearance, hips shifting inhumanly far to sit as her legs and torso followed suit as though snapping into place." I have not heard of you." she continued, now eyeing the parchment which Zax had been preoccupied with before the abrupt intrusion. " What is it you are writing?" The questions continued. As for a drink, Zyme's body could safely filter out any toxins or poisons, though as to how they would affect her is currently unknown; alcohol being one of those substances. Out of curiosity, she eventually decided to accept the offer. " A drink, yes." In a way Zax wasn't surprised since Zyme didn't seem the musical type. When she looked to her lyric sheet Zaxorie covered it with a spare piece of paper. "A new song I'm writing for my upcoming concert, trying to write anyways I'm not having too much luck." She explained and placed more coins on the table. "Bartender if you wouldnt mind." She said calling for the girl behind the bar. Zyme's attention focused back on Zax once she had covered up the parchment she had been writing on. " Song? Oh now I understand." she replied with her usual void expression. " You sing yes? Sing for me now?" Zyme asked, the glow in her eyes brightening as she awaited Zax's reply. " I should like to observe the quality of your vocalizations. I find melodic tones appealing to my senses." Zyme's unique composition was very sensitive to sounds and vibrations, though it was true she was only vaguely familiar with the concepts of lyrics. Zaxorie gave a brief chuckle when Zyme asked for her to sing. "I'm flattered you want to hear me sing, but I'm signed to the Torren Theater and I'm not allowed to sing in other venues." She said and remembered the last time Varian cuaght her singing at another tavern. Despite being the Torren's main act she still needed to spread her name more and she was willing to bend the rules of their agreement a little. But when your boss is a changling and can blend into any setting it made sneaking a few gigs here and there tricky.